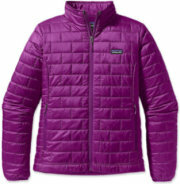 Patagonia Down Jackets are very popular because they are light in weight but provide warmth, durability, and style. 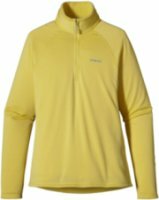 Patagonia Down Sweater - The Patagonia Women’s Down Sweater is actually not a sweater at all. It’s actually a super warm insulated jacket. 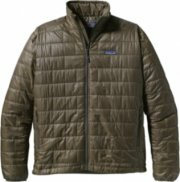 Those crazy Patagonia Outerwear folks must be losing their minds. At least they are good at making premium 800-fill-power goose down insulated women’s jackets. I wonder if calling it a down sweater when its actually a Superlight, windproof and water-resistant shell is false advertising? 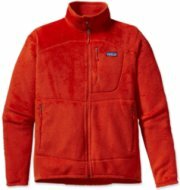 Someone should call Patagonia out. It could be a showdown. 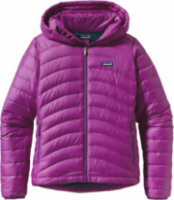 Patagonia Fiona Parka - The Women’s Fiona Parka by Patagonia is sure to be a staple in your cold-weather repertoire. This little gem can withstand the wind, the water, and the downright blistery conditions you find yourself in. How, you ask? 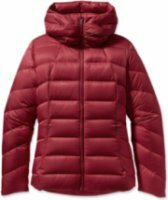 Well, with the Deluge DWR shell and 800-fill-power premium goose down. This goose down isn’t just any goose down; it’s premium European goose down. They’re obviously known for their superior down. I just made that up. Patagonia Down With It Parka - The Patagonia Women's Down With It Parka: Made with a recycled polyester shell, this knee-length down coat is for winter’s coldest days, insulated with 600-fill-power premium European goose down; now with an updated quilted pattern. If you hike Manhattan’s High Line in winter, you’ll probably have the place to yourself. 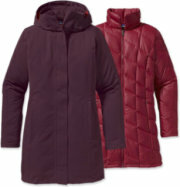 The Patagonia women's Down With It Parka makes a good companion. Insulated with 600-fill-power goose down, this knee-length parka has a 2-way front zip with wind flap and an adjustable, removable hood. 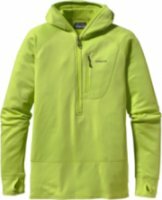 Patagonia R1 Pullover - Patagonia Women's R1 Pullover. The optimal hooded midlayer or baselayer for alpine endeavors in demanding conditions, our R1 Pullover is made with Regulator grid fleece for outstanding stretch, breathability, compressibility and durability. Sunrise to sundown, from epic approaches to alpine traverses, the versatile R1 Pullover stretches, breathes, moves moisture and insulates. Made of Polartec Power Dry polyester (41% recycled)/spandex fabric with a high/low grid interior, it provides enhanced breathability, superb compressibility and stretch, has a terrific feel and remains durable and warm. 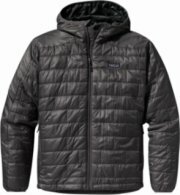 Patagonia Tres Parka - The Women's Tres Parka by Patagonia. The Tres Parka is a 3-in-1 waterproof/windproof down coat for the coldest climes; it's made of polyester stretch twill and has an H2No barrier and Deluge DWR (durable water repellent) finish. As they say in France and some parts of the Great White North a.k.a. Canada, this parka is "tres chic." There's an accent in there somewhere, but let's not get technical. FEATURES of the Patagonia Women's Tres Parka. 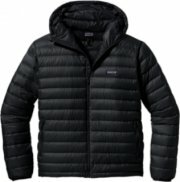 Patagonia Downtown Loft Jacket - The Patagonia Women's Downtown Loft is a 600 fill down winter jacket that can stand up to the coldest of winters. Don't let the name of this jacket fool you, though.... while it is perfect as an urban outer layer, it can also hold its own on outdoorsy pursuits. Stuffed with incredibly warm goose down insulation and protected with a 100% satin polyester shell with a Deluge® DWR (durable water repellent) finish, the Downtown Loft will shield you from the elements. 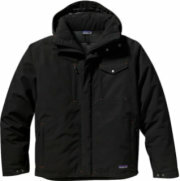 Patagonia Downtown Loft Parka - Patagonia Women's Downtown Loft Parka. This feminine, street-smart 600-fill-power down parka has new quilt lines, a tall collar that conceals a hood; made of polyester with a Deluge® DWR (durable water repellent) finish. You’ve tried positive reinforcement, time-outs and tough love, but still your weather is very, very bad. We suggest the Downtown Loft Parka. To repel tantrum-like tempests, the long coat’s satin polyester shell has a Deluge® DWR (durable water repellent) finish. 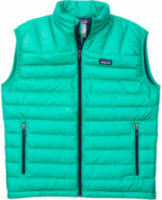 Patagonia Down Sweater Vest - The Women's Down Sweater Vest by Patagonia is your go-to piece for light weight insulation. Impossible to confuse with the sweater vests found at golf courses and bingo parlors, ours comes packed with ultra-toasty 800-fill down that traps heat in alpine conditions. It has a minimalist design that practically floats, and is so compact it stuffs into its own stretch-mesh internal pocket (with a carabiner clip-in loop). The innovative, superlight 100% all-recycled polyester shell (1.4-oz 22-denier) with a DWR (durable water repellent) finish provides wind and water protection as well as a high tear-strength; quilting stabilizes the down. 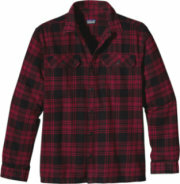 Patagonia Fjord Flannel Shirt - Patagonia Fjord Flannel Shirt - Men's: The Patagonia Fjord Flannel is a thick, beefy and ultra-comfy garment; made for days that are colder than a polar bear's toe-nails. Made of soft, long-staple 6.5-oz 100% organic cotton flannel, it provides durable, indispensable warmth whether on its own or as an overshirt. With two single-button patch pockets and 2-button adjustable cuffs. . Details. Heavyweight organic cotton flannel. Traditional long-sleeved button front shirt. Two single button pockets flaps. 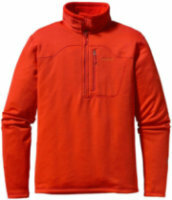 Patagonia Down Sweater Full-Zip Hoody - The Men's Down Sweater Full-Zip Hoody by Patagonia. The Men's Down Sweater Full-Zip Hoody is ultralight and ultra ready for those chilly hikes you've got planned in the near future. A superlight, windproof shell has high tear-strength and is treated with DWR (durable water repellent) finish to ensure warmth and dryness. A single draw cord hood accomadates a helmet and two handwarmer pockets provide additional warmth when used. 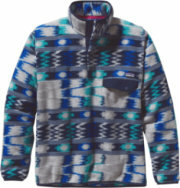 Sounds to me like this Patagonia hoody is the real deal, you guys. 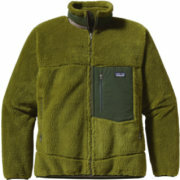 Patagonia Nano Puff Pullover - The Nano Puff Pullover by Patagonia is wind and water resistant. 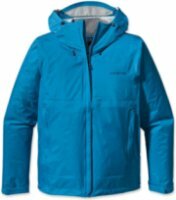 Versatile 60-gram PrimaLoft One polyester insulation provides excellent warmth and compressibility in this Patagonia Jacket. The Nano Puff Pullover can be worn as insulation or outerwear in cold. I think more things should have self-explanatory names like the pullover. For example: pants – upleggers, hat – headtopper, thongs – upbutters…that sounded better in my head. 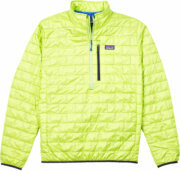 FEATURES of the Patagonia Men's Nano Puff Pullover. 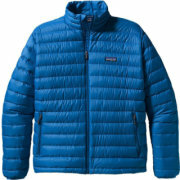 Patagonia Nano Puff Jacket - Windproof and water-resistant, the full-zip Nano Puff® Jacket is made with warm, incredibly lightweight, highly compressible 60-g PrimaLoft® ONE insulation, and is ideal as an insulating layer or outerwear in cold climates. 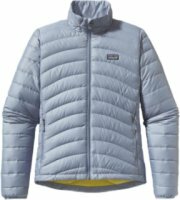 Take Patagonia's classic Nano Puff® Pullover, add a full-length zipper for greater all-around ease and, presto, the versatile Nano Puff Jacket - an insulated jacket in spring squalls, a sleek micro-belay parka on chilly rock routes and a thermal midlayer all in one.